The sculpture park at Trevethan took five years to bring to fruition. More than 20 bronze sculptures - mainly life-sized and over life-sized - were cast and installed over a 5 year period for a private collector. The works are set to their best advantage in an idyllic garden on the northern slopes of Mount Macedon in clear view of Hanging Rock. The collection also includes a representative selection of drawings. The artist has exhibited in solo and group shows in galleries throughout Australia, including, major solo exhibitions at Holdsworth Gallery in Sydney and at Melbourne Fine Art in Flinders Street Melbourne. 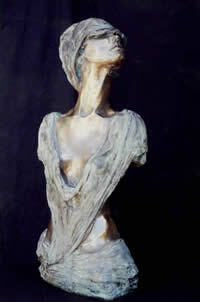 Sculpture and drawings are held in the private collections of Christian Joachim Muller, David Marriner, Paul Harding Solicitors, Alyn Fisher and collectors in Europe, and Asia. 2005	Contempora 2, Docklands, Victoria. 2004	Gallery NewQuay, Docklands, Victoria. 2004	Gasworks Sculpture Park, Port Melbourne, Victoria. 2004	Toorak Village Festival, Toorak, Victoria. 2004	QDOS Gallery, Lorne, Victoria. 2003 Drawings and sculpture commissioned for Paul Harding Solicitors, St Kilda Road, Melbourne. 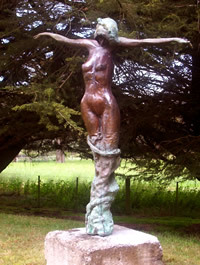 1998 – 2002 Work undertaken on The Trevethan Sculpture Park, Mount Macedon, Victoria. 1999	Melbourne Arts Club, North Melbourne. 1998	Melbourne Arts Club, St Kilda. 1998	Delshan Gallery, High St, Armadale, Victoria. 1997	A.R.T. Gallery Eden, Collins St, Melbourne. 1996	Holdsworth Gallery, Woollahra, Sydney, New South Wales. 1996	AFFA Gallery, Bendigo, Victoria. 1995	Australian Art Forms, Brighton, Victoria. 1995	AFFA Gallery, Bendigo, Victoria. 1995	Upstairs Gallery, Cairns, North Queensland. 1994	Melbourne Fine Art, Melbourne, Victoria. 1994 Sculpture Exhibition (part of International Development Programme), Jakarta, Indonesia. 1993	Mornington Regional Gallery, Victoria. 1992	Brisbane National Gallery, Queensland. 1991	Alchemy Gallery, Prahran, Victoria. 1990	Westpac Gallery, Melbourne, Victoria. 1989	Portsea Gallery, Portsea, Victoria.